Tower 3, 3rd Floor 2Bdr!! Nearest Lagoon Pool!! This is a nicely decorated, beautiful 2 bedroom condo where you don't have to wait on an elevator! The warm Florida sun and cool ocean breezes await you at this tropical third floor condo at Long Beach Resort,and it's located in tower 3, the closest tower to the lagoon pool! We just replaced the living room sofa and loveseat with new colorful Sunbrella furniture!! 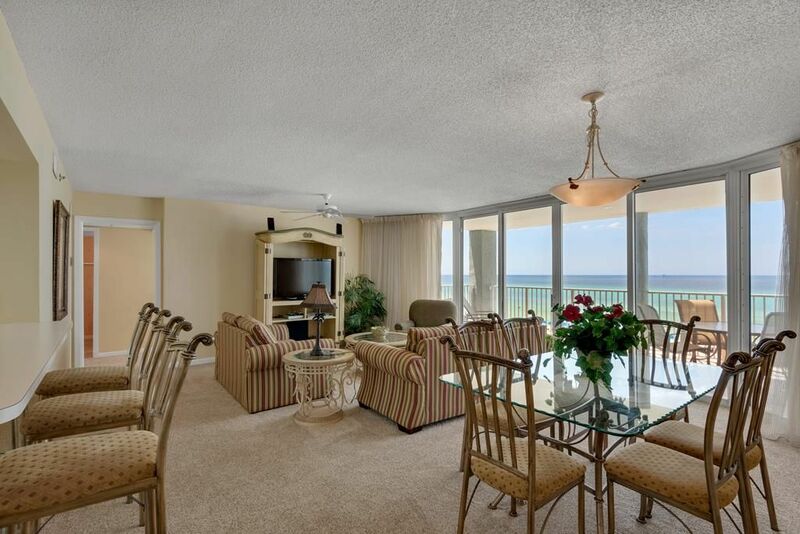 This condo features wall to wall oceanfront views from every room of this spacious 1400 sq. ft retreat, and with the location of this resort, it is convenient to everything from the great restaurants to a Super Walmart right across the street! Large lagoon pool (6800 sq. ft) with waterfalls, whirlpool spas, two Polynesian pools (heated seasonally), onsite bar and grill(seasonal), beautifully landscaped grounds, on site jet ski/umbrella chair rentals as well as 24 hour gated access and security. The living room has a new 42-inch flat screen TV and DVD, and a new queen size sleeper sofa. There is a King size bed in the master suite with 32" flat screen TV and two full beds in the guest bedroom with a 32" flat screen tv. All beds have 400 count Egyptian cotton sheets! Each bedroom has its own private bath with double marble vanities and a large marble garden tub with shower. Step out onto your huge private balcony from both bedrooms and living room area to enjoy the soothing sounds of the gulf or to watch a gorgeous Florida sunset! This unit also has a full glass storm door so that you can leave your front door open and bring in even more sunlight! Your balcony overlooks 1300 feet of private, white sandy beach with onsite jet ski & umbrella/chair rentals. This is a NON SMOKING unit, Pets NOT allowed, and renter must be 25 or older and occupy the unit during the entire rental term. Would stay there again. The people I dealt with there were very nice and helpful. We loved our stay at Long Beach Resort! I brought my family July 2018. We had beautiful weather, the beach was gorgeous, the condo was beautiful and had everything we needed. We loved the big pool and how close our unit was to the pool access and beach access. The elevators are fast and we loved having breakfast on the big balcony every morning and watching the ocean. Perfection. Only thing I would change is include 2 beach chairs with the condo rental. We thoroughly enjoyed our stay in Long Beach 3-0304. Long Beach is well run and centrally located in PCB. The condo was nicely equipped & furnished and was very clean. Kim's Condos was a great management group to deal with, very organized and the check in/out process was seamless and smooth. The one suggestion we would make is an upgrade on the king bed in the master bedroom. It was a little rough and neither of us has back issues. For those that do, this could be an issue. We are already planning our return and would enjoy staying in this unit again. This was my first time renting a condo for a getaway. This definitely made me never want to go back to a cramped hotel. The location is perfect for any other ironman athletes. I only wish that the location was this convenient for other races also. its walking distance to the race but sheltered so don't have to listen to the race all night. Greatly accommodating with appliances and kitchen utensils. Even had blender to make some shakes in the morning. Also walking distance to the Walmart for anything you need or forget. I would definitely like to tell everyone about this place but when I come back it may not be available then. So I may just keep this a secret. SHHHHH. I definitely see myself coming back here in the future. Wow, thank you so much for your great review!!! We accommodate quite a few of the Ironman athletes so we are glad you found us and look forward to your return! We enjoyed our family vacation at your condo. The staff was helpful with any need and we had no problems with the room. There was some rain but there is always something to do in Panama City Beach!! Perfect location! Really liked being on a low level floor. The whole week was wonderful at Long Beach. The unit was clean and well kept with plenty of towels! Great layout with comfortable beds and enough kitchen utensils, plates, glasses, cups, etc. The pools were clean and well kept with more than enough lounge chairs. Will definitely return! ADD 13.1% tax, $125 cleaning fee, $39 accidental damage insurance and $4 per car parking (2 cars max). Holidays and Special Events may have higher rates than what is posted.